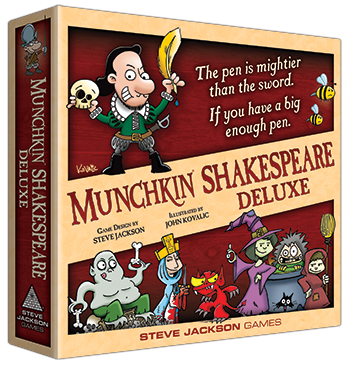 Munchkin Shakespeare is out! It's been reaching Kickstarter backers for a month or so; I've really enjoyed watching the backers posting their just-unboxed sets on Twitter. It should hit stores any time now. I suppose I should say a bit about gameplay. This is a "Deluxe" set, so it has a board and standies. It uses all the classic races – Elf, Dwarf, and Halfling. As to classes, it starts with the venerable Wizard, Warrior, Cleric, and Thief, but it also adds Bard to the mix. Since there are Clerics, there are Undead to turn. My favorites are Henry IV Part I and Henry IV Part 2. Yes, we went there. I also want to mention the demo set spawned by Shakespeare. Called (of course!) the Munchkin Shakespeare Staged Demo, it has 17 cards drawn from the Shakespeare set, but with alternate art by Lar deSouza! Use it to teach your friends the game, or just add to your own set and enjoy the ineffable art-ness of it all.